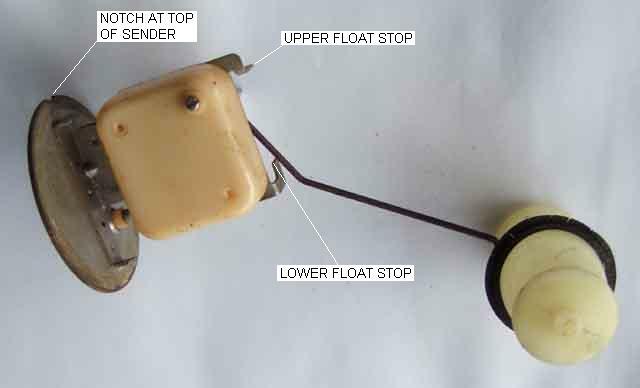 What's inside the tank: This is the sender used from March 1965 to the end of the 1976 model year that is attached to the tank with a locking-ring, although all the senders work on the same basic principle of a float arm moving a wiper contact across a winding as the fuel level rises and falls to vary the resistance. This change in resistance is used to alter the gauge reading. Float shown in the 'empty' position showing the upper and lower 'stops' for float arm movement. The screwdriver slot isn't for calibration as one may hope but is just cut into the end of the float arm where it comes through the plastic box which is one half of what locates the arm. The tabs of the upper and lower 'stops' do give some adjustment of the upper and lower extremities of movement of the float but they are designed to set the relative positions of the wiper to the ends of the resistance winding at the upper and lower extremities. 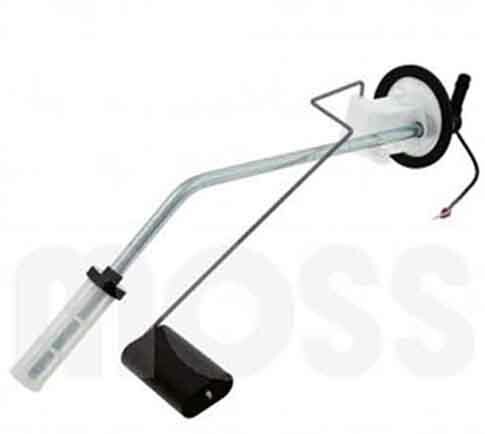 You may be able to get a bit more travel of the float by adjusting these but go too far and you will allow the wiper to come off the end of the resistance winding which will cause the gauge to drop back past E. You can also bend the float arm up and down which will alter the relationship between fuel level and wiper position and hence gauge reading but unless you get it right first time is much more of a fiddle to calibrate the gauge than adjusting the gauge itself. As new senders seem to stop short of both E and F bending the float arm will result in being even more short of F if you adjust for E or vice-versa. 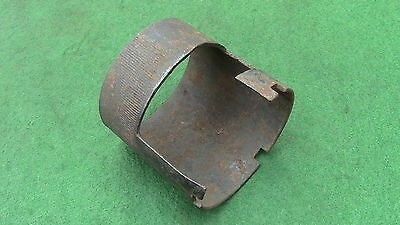 Note also the notch at the top of the sender mounting plate, however this is not the main part that ensures correct orientation in the tank. 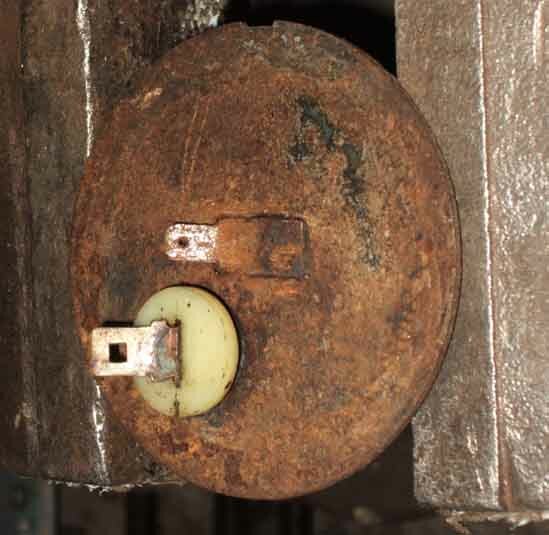 That is done by two offset tabs on the inside face of the mounting plate - seen here to the left of the yellow centre line, that engage in cut-outs in the tank. 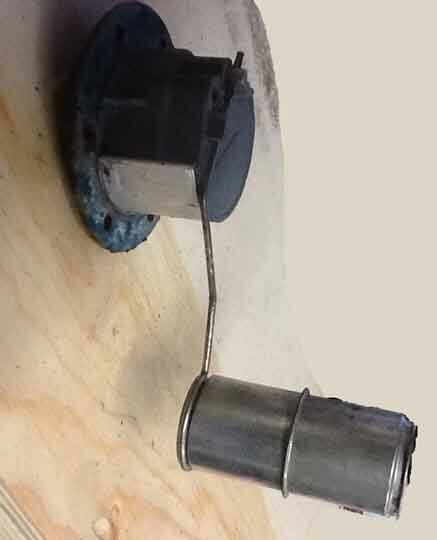 Showing the standard spade in an insulator for the green/black gauge wire, and the under-sized earth wire spade riveted directly to the base. The other side again with the float shown in the 'empty' position showing the float arm going through the metal back-plate and the end of the resistance winding coming out through an insulated plug and going to the back of the insulated spade terminal. Note the rubber ring on the float which in theory is to prevent the float rattling on the bottom of the tank with low fuel levels. However in practice the lower float arm stop further downward movement of the float quite some time before it reaches the bottom of the tank. On my cars this happens with somewhere between a half gallon and a gallon before they actually 'run out' i.e. the fuel level drops below the level of the pickup. Inside the plastic box, float in the upper or 'full' position. You can see the wiper attached to the float arm and the resistance wire wrapped around the former. Where the float arm comes through the metal back-plate it picks up a earth connection which it then applies to the resistance winding by the moving wiper. 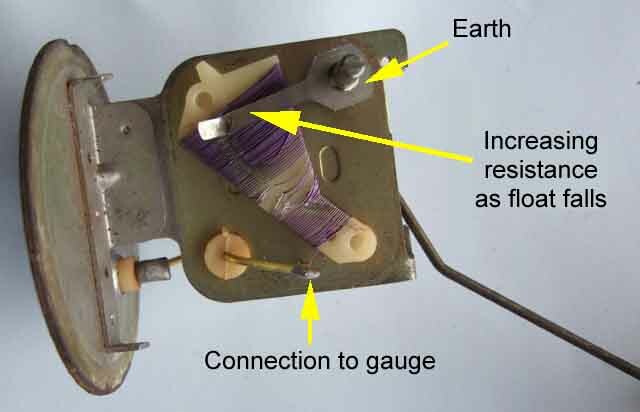 The resistance winding has a connection from its lower ('full' or low resistance) end to a stiff wire which goes through an insulator in the back-plate to the insulated spade connection on the sender. This means that when the tank is full there is very little resistance in circuit, a relatively high current flows, and the fuel gauge reads full. As the level in the tank falls, the resistance increases, the current falls, and the gauge reading reduces. Clearly visible is the damage to the windings probably caused by a poorly manufactured or adjusted wiper. This is the 'original' (or at least very old) unit off the roadster, but the 'original' and the first replacements to both roadster and V8 all failed in exactly the same way. The second replacements to both cars have (so far!) lasted much longer. Float shown in the 'empty' position. All of the resistance is now in circuit from the earth on the wiper to the terminal leading to the gauge, so minimal current, and minimal gauge reading. In both pictures you can clearly see the change in shape of the winding former about 1/3rd the way from F to E. The narrower width at the F end means the turns are shorter, so there is a relatively small change in resistance as the float starts to fall from F. When the former starts widening, the turns are getting longer, so the rate of change of resistance gets higher as the float falls further. Then there is a change from wide-spaced turns to close-spaced turns about half-way up this widening section, about 2/3rds the way from F to E. This increased number of turns also causes the resistance to increase rapidly as the float moves down, doubly so with the increasing length of the turns. The reason for these two changes in the rate at which the resistance increases as the fuel level drops, is partly because of the natural non-linearity of the thermal gauge and partly because the float moves in an arc, and is an attempt to compensate for those. However it's only partially successful. It's quite normal to see a slow fall from F to 1/2, then shortly after that it seems to drop like a stone towards 1/4, then thankfully slow again after that. Whether the modern 'solid state' senders are any different isn't known. Potentially (ho ho) they could be as the wiper passes over a series of contacts with resistances wired between them. 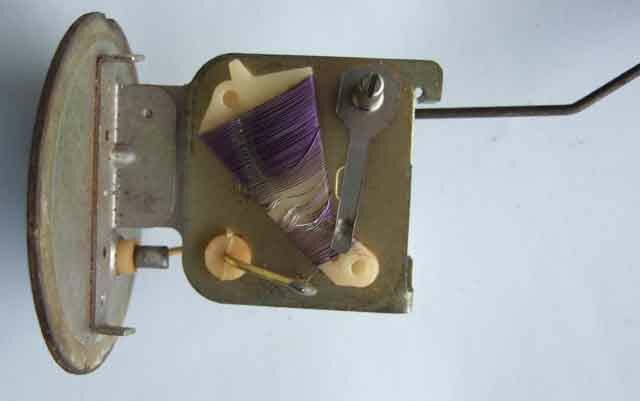 Even to maintain the existing 'linearity' the resistance between each contact would have to vary in the same way that the winding resistance varies, so in theory they could have varied them in such a way as to give a linear movement at the gauge, but whether they did or not is another matter. 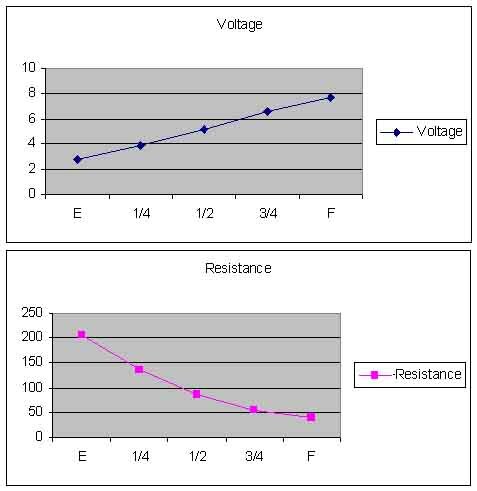 Voltages and resistances needed to drive the gauge. Note the voltage is linear but the resistance isn't, almost certainly due to the positive temperature coefficient of the resistance wire inside the gauge, combined with the changing force needed to bend the bi-metal strip at different points along its movement. Also note that my voltage to show E is higher than normal as I've chosen to have about a gallon left at that point. But whilst the gauge clearly has factory (Smiths, not MG) calibration marks at E, half and F, at the end of the day it's what your sender characteristics are that determines what your gauge will show, and I have found three replacement senders out of four needed to gauge to be recalibrated, the first replacement for Vee showing significantly above E when I ran out. 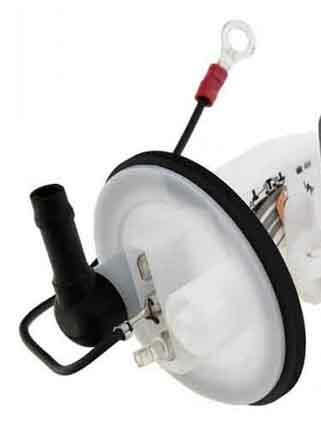 The tank for this type of sender, with the fuel outlet (arrowed) just rearwards of the sender. 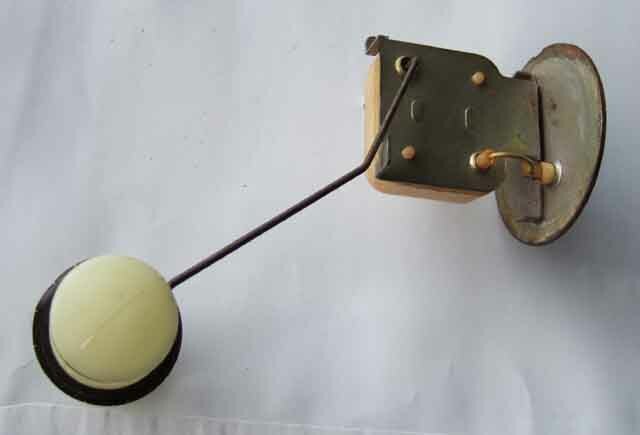 Sender locking-ring. 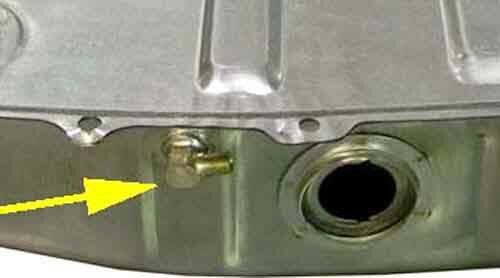 Three tapered sections (A) on the ring slot under turned-over lugs (B) on the tank. Originally Service Tool 18G1001 would have been used, but in the absence of that I've always done it by going round the three tabs (C) on the ring in turn bit by bit tapping carefully, turning the ring anti-clockwise to remove and clockwise to replace. If there is petrol in the vicinity you should be careful not to make a spark, perhaps by using non-ferrous tools, but you shouldn't be striking it that hard anyway. 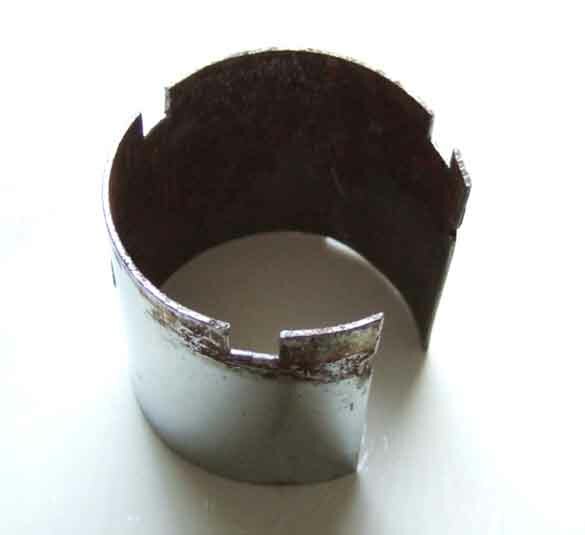 When removing turn the ring anti-clockwise far enough to align the three recesses in the ring (D) with lugs 'B' so the ring can be completely removed, reverse for refitting. When tightening tabs 'C' should stop short of lugs 'B'. 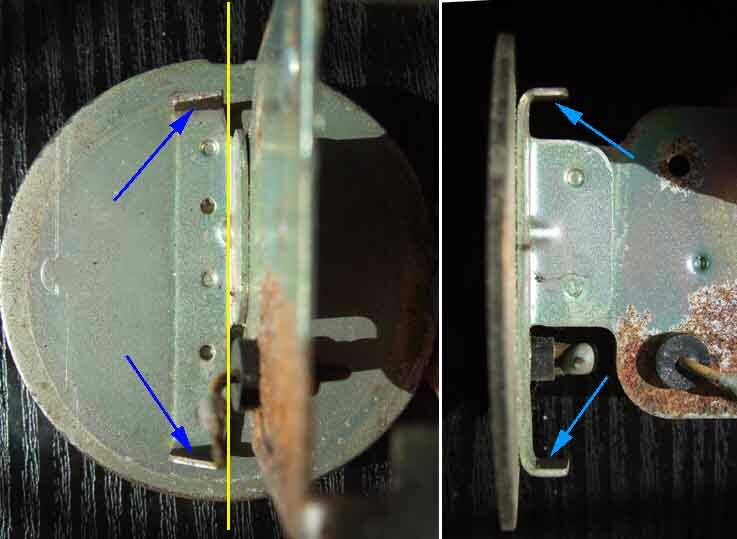 All three tapered sections should be locked under their respective lugs or the sender will not seal. Locking ring removal tool 18G1001. On the basis of that not difficult to fabricate one. 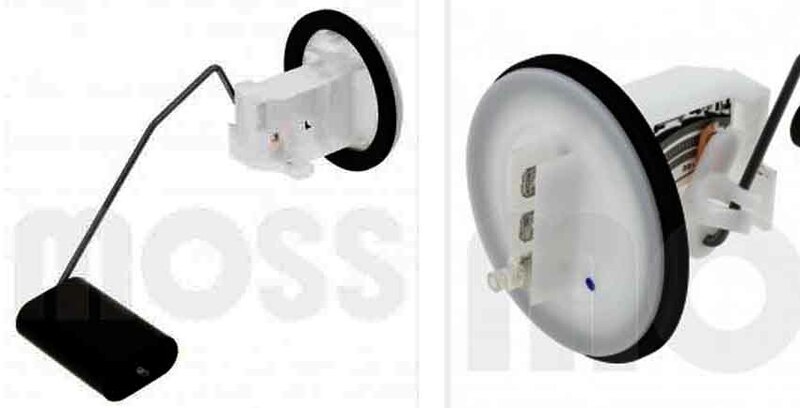 I'm not sure why it needs a cut-out, much less an L-shaped one, surely one would disconnect the wires before undoing the locking ring? A couple of hours - first looking for something about the right size (plastic cap of aerosol contact adhesive) to act as a pattern, then for a suitable bit of metal (an off-cut from an exhaust trim that's been in a box of metal bits for years). Longitudinal cut so I can open it out to the right size (about 6cm), then three slots at 120 degree spacing (about 5mm square), and Bob's my uncle. Haven't used it anger as I don't want to break the seal until I need to. May need a couple of holes drilled through the outer end for a tommy-bar. I don't think that end will need welding up like the above as it's pretty hard metal and needed quite a bit of effort with two pairs of pliers to open up.